There were four of us at the Independence Lake trailhead, off the Mountain Loop Highway, standing around, waiting to get organized for some trail maintenance. I was a little worried, mostly because I might be perceived as a wimpy city chick, but also because I really had to pee and there was no privacy to be found. I took care of the latter (there is a purpose for mini-vans) and the former ended up being an unnecessary concern. 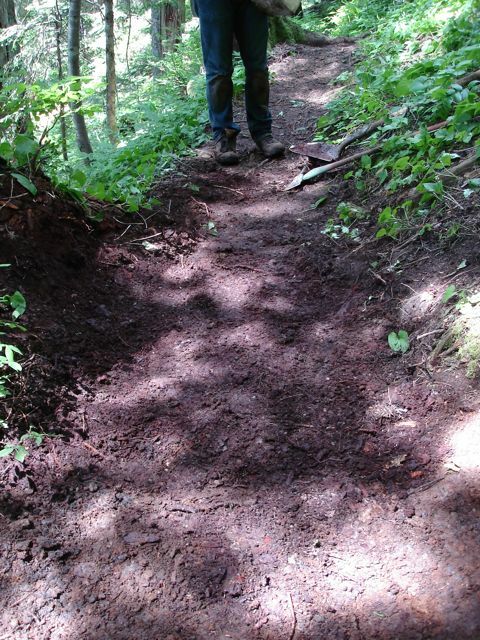 The WTA organizes work parties all over the state's national forests and parks to volunteer in the role of trail maintenance throughout the year. Our leader, Mike, a WTA foreman and volunteer, spends his summers from Tuesday through Friday out in the woods, taking groups of volunteers, newbies and seasoned alike, to a trail that the local agency has designated as needing work. 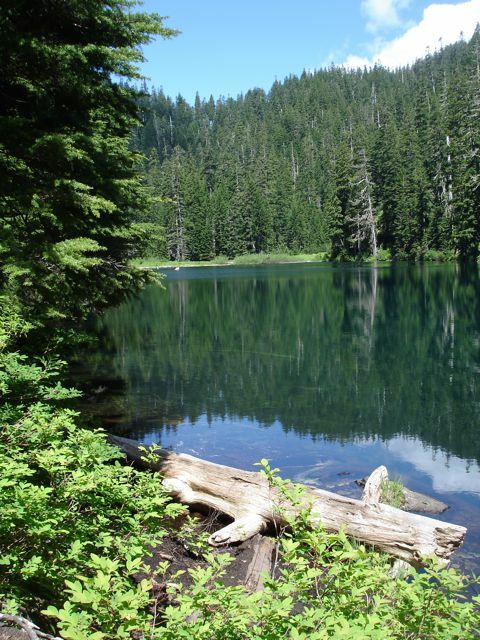 Last year, WTA's volunteer hours numbered 94,000 and that saved the Forest and Park Service an estimated $900,000! As budgets get cut, the WTA's efforts are even more valuable. OK, enough with the background, lets get to work. 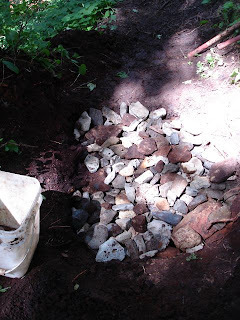 We donned hard hats, were given shovels (also a great leverage tool for moving rocks), pulaskis (an axe / adze combo) and buckets for transporting rocks. 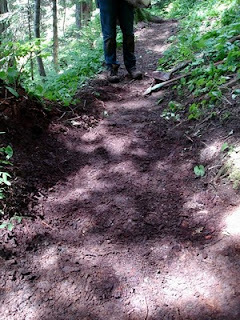 There were three main areas to work on: placing a step into a slippery area, relocating tread and obscuring a system of roots and removing a large rock that was sticking up in the middle of the trail. There is a lot of planning and energy that goes into every feature of a trail so doing this type of work is very illuminating. Mike explained each project and we set to work. My task of putting in the step ended up being easier than he had thought, mainly because I went about it the way a woman would. The difference is: a man would move rocks, cut through huge roots, each one becoming its own small project, to get the step in precisely the right spot. A woman would see that there was an easier way, requiring less overall effort, by changing the slope slightly, then avoiding moving heavy rocks or sawing through living things, placing the step with finesse and finding the right rocks to support it. Either way works; it's just about how much energy you want to expend. The next project I helped with involved one huge rock, already excavated by a crew earlier in the week, that had been sticking up out of the trail bed. Zack had already dug the hole deeper and we were able to move it to its side so it could effectively be buried below the trail. The next step involved going to the creek and collecting small rocks to cover over the huge one that would allow soil to fill in the cracks and make it into a solid trail surface. I thought my wimpiness would surely come into play here, as I could only manage to carry the bucket half full of rocks, but Zack could load his up all the way. I think it may have evened out as I made more trips back-and-forth. Soon, though, we amassed a pile of rocks, tossing them into the hole, filling up the space and then covered it in soil. Mike was impressed; we had made the trail level and solid and no one will ever know about all the work under the surface. Who knows what we could have buried in there! Alex related a saying from his town of Rockport, "a good friend will help you move, a really good friend will help you bury the evidence". Another highlight of the day was taking a quick (and I mean quick!) 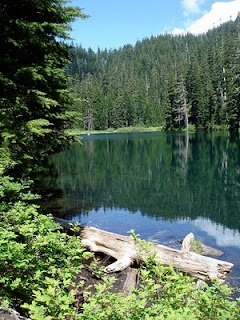 dip in Independence Lake, less than a mile from where we were working. 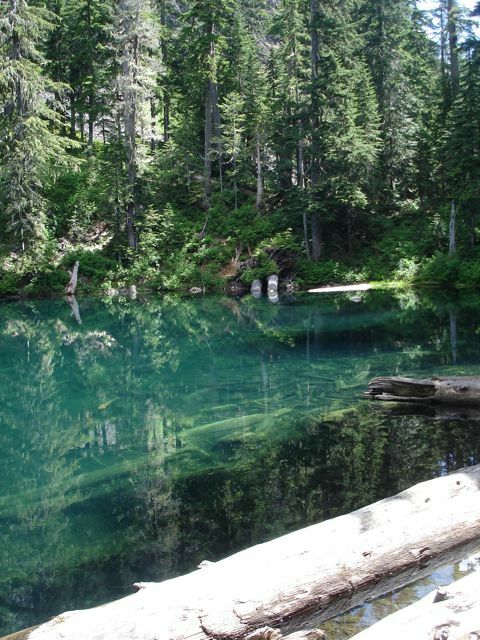 The water was clear green and I wondered if it was very cold. I didn't put my feet in until I had my clothes off and by the time I got to a rock to push off into the water from, my feet were numb. Three strokes out, three strokes back, out of the water and into the sun. We hiked out and enjoyed cookies and soda in the blazing sunshine and talked about what other trails we might like to work on. For an added incentive, aside from the feeling of accomplishment and cookies, working 2 trail parties on federal lands nets you a yearly trails pass.